Search My Ancestry: Tips from David Olusoga's 'A House Through Time' - How to Find out More about your Ancestors' Neighbours - and Why? If you enjoyed the first episode of David Olusoga's wonderful new programme A House Through Time (4 episodes, 9pm BBC2, Thursdays) you might well also have been inspired to start researching the history of the people who once lived in your home or your ancestor's home. Olusoga's methods for digging out the juiciest details of the past are many and various - but this post focusses on just one, the way he considers the neighbours of his central characters. Last Monday's treat looked at some of the early inhabitants of number 62 (or 58 as it then was) Falkner Street, Liverpool: a gentleman who failed to make ends meet and eventually had to sell up, a couple who rose from servant status to the top of local society, and a cotton merchant who became a mercenary in the American Civil War. Crucially, Olusoga researched the make-up of the neighbourhood itself, remarking, for instance, on the tailors, merchants and seamen who lived at other addresses on the same street. By gaining an insight into the lives of the neighbours, he could compare and contrast his main characters with the rest of their community. How far were they typical? How far were they unusual? This is a sure way to turn social history into a good story and you can do it too by accessing records that exist online. The neighbours were not a mere backdrop to your ancestors’ lives. They were the people who contributed to its overall flavour and occasionally, they may even have taken an active part in your family’s developing history. The neighbours are the people to whom your family would have spoken most frequently on a daily basis, the ones would have informally minded their children, sat with their sick and helped to lay out their dead. 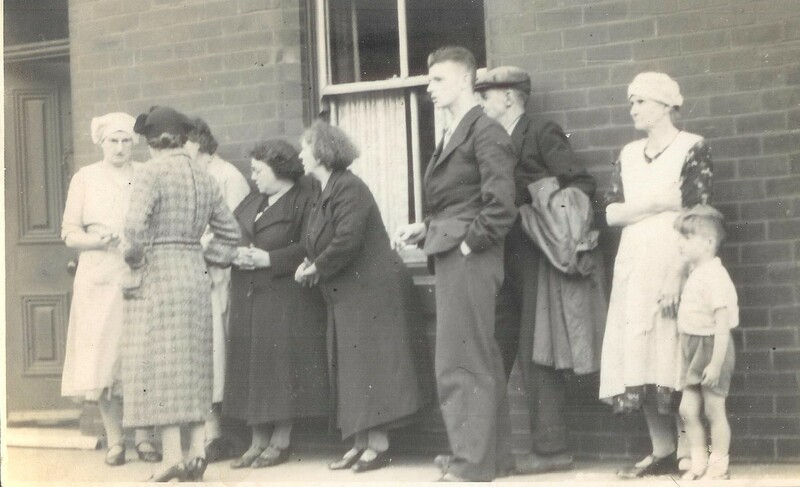 In times when shops closed early and telephones didn’t exist, it was to the neighbours that your ancestors would go if they ran out of food, or needed physial or emotional assistance of any kind. Your ancestors will have shared many experiences with their neighbours – from disease and unemployment to weekend pastimes, holidays and festivals. Neighbours are also the people next to whom your ancestors probably sat in church, and with whom they drank, and played sport at local clubs and pubs. And it’s beside the neighbours too that your ancestors would probably be buried. All in all, the lives of the people next door may have been more similar to your ancestors’ own than that of their actual kin. So, it’s worth taking a peek behind the net curtains (metaphorically speaking) to find out more. Nineteenth - and early twentieth century- censuses are probably the most useful documents for this purpose. (1841 to 1911 are now available online). To discover more about relevant neighbours, scroll down the page and visit the pages before and after the entries for your ancestors’ family. Birth, marriage and death certificates may reveal that the people next door were the informants or witnesses at major events in your family’s history. Trade directories (many of which are searchable online at www.historicaldirectories.org) will give you the names of people running businesses adjacent to those run by your family. Such directories tend to be organised in several different ways (alphabetically, under type of business and – crucially for the study of neighbours – as building by building indexes of streets). A wealth of other records including: court records, membership books of working-men’s clubs, records of scout groups, the account books of local friendly societies and sick clubs, passenger lists and newspapers may unexpectedly reveal the names and addresses of those who lived near to your ancestors and who shared aspects of their lives with them. With people in the past settling away from home less often than they do today, it was common for siblings, parents, aunts, uncles and cousins to live in neighbouring streets, if not in neighbouring houses. It is always worth scrolling down through census pages immediately before and after those on which your ancestors appear just to see whether the same surname (or any other family surname) turns up. But be careful, identical surnames do not necessarily indicate a family connection. From 1861 onwards, the censuses for England and Wales asked whether houses were inhabited or uninhabited. In theory, then, you should be able to get a feel for exactly how populated your ancestors’ street or area was. But take care with this information: in fact, many buildings in city centres which may have been full of life during the daytime, would have been uninhabited on the night of the census because they were workshops and not living quarters. From 1891, the census asked how many rooms in a house were occupied (if fewer than five) and Scottish censuses from 1861 also asked how many rooms in each residence had windows (a question generated by the general mid-nineteenth-century concern about the lack of ventilation in overcrowded homes. By looking at these figures for your ancestors and their neighbours, you should be able to work out how your ancestors' houses compared in size (and light!) to those in their immediate vicinity. Comparing the employment of your ancestor with those of his immediate neighbours (as recorded on the census and in trade directories) can be an illuminating exercise. Were the neighbours in the same basic income bracket as your ancestors or not? Was it common it that area to take in lodgers? Were your ancestors in some sort of working relationship with the neighbours? Perhaps they occupied a lodge house on a large estate? Maybe the two families shared a workshop? My great-grandfather, William Symes (living in 1891 at number 29 Llanfair Street, Ancoats) was a ‘carter’, sometimes described as a ‘townsman’. His neighbour, Mr Hoyle (at number 23) was a ‘railway warehouseman’, another, Mr Lewis (No 27) was an iron ‘turner’. Mr Dean (at number 31) was an ‘iron moulder’ (and his mother with whom he shared a house was a charwoman). Mr Dore (round the corner at 2, Waugh Street) was a ‘sewing machine mechanic’. The offspring of these men were ‘carter’s assistants,’ ‘general labourers’, ‘lurrymen,’ and ‘coal dealers’. In this sense, the Symes family were entirely typical of their neighbourhood being employed in the lower (but not the lowest) end of industrial-related work. Censuses asked for the place of birth of everyone living in a house. It is interesting to compare birthplaces of all the inhabitants of a street. 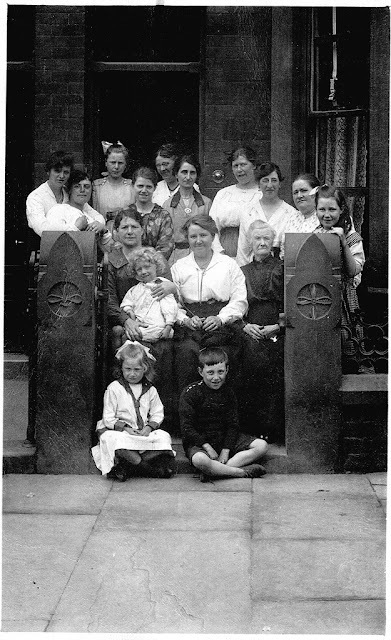 In late nineteenth century Manchester – a city to which thousands migrated - it is hardly surprising to find that the adult inhabitants of a single street were all born elsewhere in places such as Cheshire, Lancashire and Derbyshire. My family, unusually, had come from much further afield. William Symes was born in Martock, Somersetshire and his wife Elizabeth (nee Terrell), in Henstridge, Somersetshire. I have often wondered whether they were considered a bit strange or different because of their south-western accents? Did they have different habits and customs, different ways of dressing and different tastes in food from their northwesterly neighbours? By contrast, you may find that your ancestors’ neighbours all hail from a similar area. Many inhabitants of particular Irish villages, for instance, came and settled in England’s big industrial cities and it was natural that they would want to live close to those who had been neighbours at home. It’s pleasant to think of our ancestors gossiping with their neighbours across hedges and fences. But remember that, especially in the growing industrial cities, many languages would have been spoken within a small geographical area. Manchester, for example, had an influx of Russian Jews, German and Italians, amongst many other nationalities. Scottish censuses asked whether or not residents could speak Gaelic. It is interesting to compare neighbours in this respect. Residents who could not speak the language of the rest of their community may have been very isolated. 6. Families Large and Small? Neighbours sometimes entered into our family histories at crucial moments. If a neighbour witnessed a birth or a death or a marriage, his or her name might be recorded on the corresponding certificates. My great-great-great grandfather, also William Symes, was a farm labourer, who died in Martock, Somerset of typhoid fever in 1864. The informant of his death was a woman named Sarah Margery who is described as being ‘ in attendance.’ This suggests that she was nursing him through his final illness. I searched for Sarah Margery in the Martock census and discovered that she was a neighbour of William’s. In the census of 1881, she appears as a ‘washerwoman’ and in 1891 as a ‘sick nurse’ lodging in the house of an elderly local lady. This local do-gooder is still recorded as living in Martock in the census of 1901. 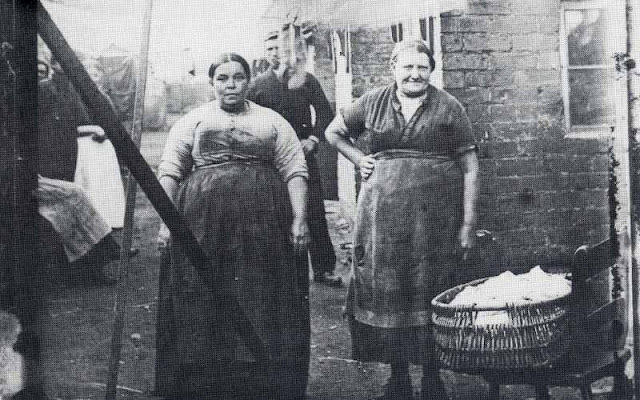 Neighbours doing their washing in Wigan, late nineteenth century. Thanks to Ron Hunt, Wigan World Website. Court records reveal that many legal disputes in the past – just as now - were between close neighbours. Neighbours may have disputed boundaries and entitlements, for example, and there is always the possibility that your ancestors suffered from the types of crime, such as assault and affray, that often occur between people living in close proximity. The records of serious crimes which resulted in cases at the Old Bailey and the Assize Courts are kept at the National Archives (http://www.nationalarchives.gov.uk/). Those for smaller crimes, which were dealt with in Magistrates’ courts and Quarter Sesssions, are likely to be held in local archives (but can be searched via the same website). The addresses of the plaintiffs and the accused will alert you to those cases in which neighbours were involved. The neighbours may have been even more actively engaged in joint enterprise with your ancestors. When I was researching the history of my great-great uncle, Lancashire miner, Rueben Wilkinson, I began by assuming that he had travelled to America in 1907 as a lone adventurer seeking to make his fortune. As I scrolled down through the relevant passenger lists at (http//:www.ancestry.co.uk), however, I realised (by looking at their recorded addresses) that many of the other passengers were from the same part of Lancashire (from Leigh, Westhougton and Wigan). They were all going to work as miners in the town of Roslyn, Washington State. Far from being a man on a lonely mission, Rueben was one of a group of many neighbours. His trip was a community affair. If you are researching ancestors who fought in the First World War, it is worth scrolling down through the 1911 census as well as looking at military records. Many neighbours and friends joined up together – a phenomenon actively encouraged by the Secretary of State for War, Lord Kitchener, in the early days of the conflict. Kitchener believed that more men would join the army if they thought that they would be fighting alongside friends, neighbours and work colleagues (‘Pals’) rather than being allocated to regular army regiments. All this goes to show that if you are dipping into census and other material simply to find details about your own ancestors, you are missing a trick. Taking a look at the circumstances of ‘them next-door’, can put you in the picture of your own family’s lives in a way no photograph or book ever can. A house after all is part of a street, an individual (ancestor) is part of a community. If you have been inspired by David Olusoga's 'A House Through Time' and have an interesting story about an article about your ancestors and their neighbours, please use the COMMENTS box below to tell us about it. If you have found this article useful please share with friends, family and fellow family researchers using the share icons below: Twitter, Facebook, Email, Google+ and Pinterest. Tips From A House Through Time - Was Your Ancestor a Lodger? Want to find out more about your house and your street? Take a look at this project on 20 streets in Brighton and Hove for lots of ideas on how to go about it. My House My Street Project. http://www.census-helper.co.uk/victorian-life/ Gives some general information about some of the norms of Victorian employment, income, family size etc. http://www.localhistories.org/vichomes.html On the accommodation and facilities in Victorian homes of all classes. Backe-Hansen, Melanie, House Histories: The Secrets Behind Your Front Door, The History Press, 2011. Barratt, Nick, Tracing the History of Your House: The Building, The People, The Past, PRO Publications, 2006. Benson. John, The Working-Class in Britain, 1850-1939, I. B. Tauris, 2003. Blanchard, Gill, Tracing Your House History: A Guide for Family Historians, Pen and Sword, 2013. Brookes, Pamela, How to Research Your House: Every Home Tells a Story, How To Books, 2007. Laybourn. Keith, ed. Social Conditions, Status and Community, 1860-c.1920: Sutton, 1997. Style, C. House Histories For Beginners, Phillimore and Co., 2006. Symes, Ruth, Family First: Tracing Relationships in the Past, Pen and Sword, 2016. Turner. William, Pals: the 11th (Service) Battalion (Accrington), East Lancashire Regiment, Pen and Sword Books, 1993. This article first appeared in Family Tree Magazine UK. What a wonderful post. I was actually browsing census records yesterday only to discover that a young widow had remarried and was living two houses away from her former in law’s. But, you’ve introduced even more perspectives on what to look for. Thank you.